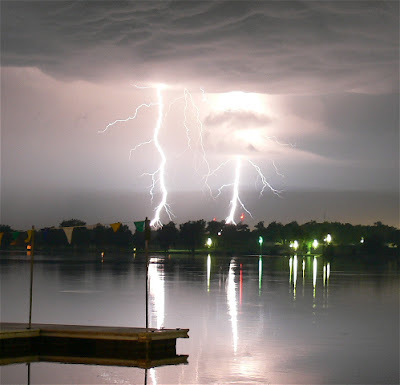 In the old days, my former Grace College photography students will remember, I offered an automatic “A” in the course for anyone who could catch a photo of a lightning strike in progress. I don’t recall that anyone ever did–but we sure had a lot of wet students each semester! Well…Dave Mitchell, recently retired from the pastorate in Hawaii and now living in the Winona Lake area, did us all proud with this double-strike shot off the dock at Winona Lake by the Boathouse Restaurant. Dave didn’t say so, but I assume this was from Wednesday two nights ago, when a spectacular lightning and thunderstorm rolled through the area.